What's better than one Who Was? book? Six Who Was? books! Who Was Frederick Douglass? By April Jones Prince, read by John H. Mayer. Listen to find out more about a boy born into slavery who taught himself to read and write, a young man who escaped to freedom in the North, and the father of the civil rights movement. Who Was Nelson Mandela? By Pam Pollack & Meg Belviso, read by Mark Bramhall. Listen to find out more about a boy whose African name means "tree shaker," a man who spent twenty-seven years in prison for challenging apartheid, and the first black president of South Africa. Who Was Rosa Parks? By Yona Zeldis McDonough, read by Adenrele Ojo. Listen to find out more about a girl who liked fishing, a teenager who cleaned houses to make money, and the woman who took a stand by sitting on a bus. Who Was Jackie Robinson? By Gail Herman, read by Dominic Hoffman. Listen to find out more about a boy who always stood up for himself, a teenage sports superstar, and an African American who changed the face of baseball forever. 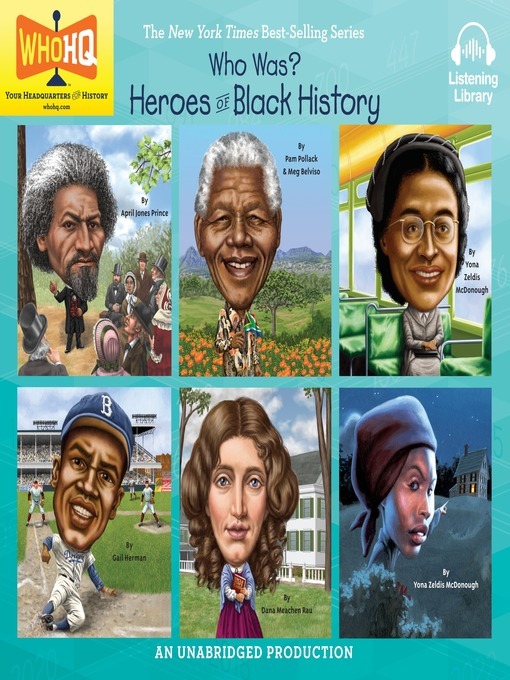 Who Was Harriet Beecher Stowe? By Dana Meachen Rau, read by Susan Hanfield. Listen to find out more about a minister's daughter from Litchfield, Connecticut, a woman who fought against slavery, and a bestselling author whose book set the stage for the Civil War. What Was the Underground Railroad? By Yona Zeldis McDonough, read by Deana Hurst. Listen to find out more about a railroad with no trains or tracks. Trips on this railroad always headed north, and the railroad was the route to freedom for thousands of slaves.